John Davis on May 15, 2018, with "Tiki Kat" boats he began renting at Harbor Point in Stamford via his startup Captain John's Tiki Tours which will include floating tiki bars and yacht charters. Drawing a visual comparing Stamford Harbor to Waikiki Beach represents an exercise in mental gymnastics for most anyone. But as the warm weather arrives in Connecticut, the Stamford waterfront scene will soon include floating tiki bars straight out of any Hawaiian brochure. Norwalk resident John Davis launched Monday in Stamford his Captain John’s Tiki Tours & Boat Rentals, offering three excursion options including floating tiki bars that can accommodate up to a half-dozen patrons as they meander through the harbor. 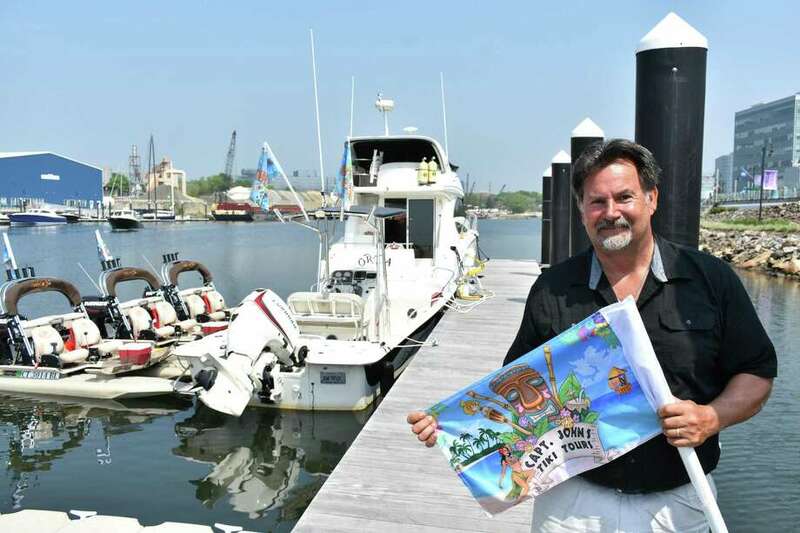 Davis said he had considered both Stamford and Norwalk for Captain John’s Tiki Tours, ultimately choosing Harbor Point and its ample dock space for his flotilla. The company has already been drawing interest including from local companies for corporate events. The “tiki taxi” package costs $65 per person or $350 for exclusive use of the floating bar for a 75-minute session, including a short safety briefing, with drinks available on a “bring your own bottle” basis. In addition to the tiki bars, Captain John’s Tiki Tours offers “tiki kat” rentals, small catamarans with side-by-side seating for two that zip along like jet skis. A tiki kat rental costs $199 for a two-hour session that includes time reserved for the safety overview and an overall orientation, with rentals restricted to those age 21 and older who have a driver’s license. Davis said he will supervise boaters while on the water. The company also offers charter trips on a Meridian yacht, with guests able to pick destinations from Manhattan to many points in Connecticut and New York along Long Island Sound. Floating tiki bars are becoming more common in northern climes like Mystic, New York Harbor and Lake George, N.Y. , as well as tropical resorts like Key West and Fort Lauderdale, Fla. Davis had his tiki bars built by Tiki Boatworks which has a manufacturing plant in Colonie, N.Y., and which was on hand for Norwalk Boat Show last September. Growing up on the water at Stamford’s Shippan Point and trained as an instructor in the U.S. Coast Guard Auxiliary, Davis spent several years as a sales manager at Rex Marine and the Formula Boats showroom on Water Street in South Norwalk, where he also created boating training programs and introduced a charter service. He left to become a manager with Carefree Boat Club in Westport and Captain’s Cove marina in Bridgeport, with Carefree adding a location last summer at Harbor Point. Davis said Captain John’s Tiki Tours offers a different kind of a water excursion, and is hopeful it will become a big hit. Information is online at www.captjohnstikitours.com or by calling 203-614-9268.